The plant chia, which gives the eponymous chia seeds, is a hardy flowering plant from the family of gentle mints who is an extremely rich source of minerals and nutrients. These healthy seeds have a moisturizing effect on our body, stimulate digestion and regulate bowel movements and regulate electrolyte levels. Chia seeds are recommended for those who want to lose weight, since the effect of body fat burn is achieved faster, and provides a feeling of satiety and is an excellent replacement for almost all salty snacks. Although it is not a grain, it is certainly healthier than them because it does not contain gluten, and can be combined with various dishes. Hereinafter, we present you all the health benefits of using these seeds, how to use them and who should use them. Chia seeds are tiny black, white and dark brown seeds that come from Salviahispanica plant, which is a type of mint. Natural habitat is South and Central America, specifically the area of ​​Peru, Guatemala, Bolivia, Paraguay and Mexico. Since ancient times it was cultivated and used as the main ingredient by Aztecs and Mayans, and the name chia, in fact, is an ancient Mayan word for strength. Although it has been used for thousands of years, it has become popular in the last 25 years, because scientists found that it is rich in omega-3 fatty acids that make up a third of its composition. In addition, chia seeds are rich in antioxidants and fibre, but also contain high levels of magnesium, zinc, iron and calcium. As such, this valuable plant can greatly influence the improvement of health, especially when it comes to the prevention of heart disease, high blood sugar, and it proved to be excellent when it comes to the regulation of digestion. Chia seeds are very rich in minerals. Manganese, which is very important for metabolism, growth and development of muscles and bones. Phosphorus, which is also essential for the maintenance and regeneration of tissue, and next to it is copper that we most often lack in the diet, and it is important for the health and proper functioning of the heart. It is interesting that in just two tablespoons of chia seeds there is twice as much potassium than in a banana. Iron, as an integral part of haemoglobin in red blood cells, is involved in the transport of oxygen throughout the body, and this mineral chia seeds also abound in. Finally, there is calcium, which in addition to being good for the bones, is particularly suitable to our brain and nerves. Although rich in essential minerals, chia seeds do not represent a plentiful source of vitamins. However, vitamins A, B, E and D, which are suitable for vision, hair, nails, skin, teeth, and muscle and nerve tissues are present. That is why they are used as a food additive to natural fruit juices and desserts, and they do not contain any sugars, gluten and oxides. According to scientific analysis, 28 grams of these seeds contain 138 calories, 8 grams of fat, and 12 grams of carbohydrates, 10 grams of fibre and 5 grams of protein. This means that one spoonful a day provides 18 percent of the daily requirements of calcium, 27 percent of phosphorus, manganese and 30 percent of somewhat smaller amount of potassium, zinc and copper. Since chia seeds have a completely neutral flavour, they will not have an impact on other food you consume at the same time, so you can use it in addition to all meals. The most commonly recommended is the combination with salads, chia seeds are suitable with the toast, in addition also to cakes and pastries, and milled you can add them to yogurt and kefir. They are ideally combined with nuts, corn, almonds and millet. You can use them in all three meals. Let's say, for breakfast, take a cup of kefir and add a tablespoon of seeds along with oat bran, flakes or muesli. In addition, it can easily be combined and used when it comes to lunch. You can add them to a salads, which will increase your intake of protein and fibre and whole meals will be easily digestible. Also, the seeds you can insert into the soup, meatballs or to regular meat, because they are an ideal substitute for bread crumbs. To end the day, you can mix them with the yogurt and grate a fresh apple and add a little candied fruit. How much Chia seeds can be consumed daily? Unlike flax seeds, chia seeds do not have to be grinded to consume them and for their nutritional value to be fully expressed. They are easily digestible, very pleasant to taste and can be consumed in a daily dose of 20 grams. It is not advisable to fry them, as heat treatment loses valuable nutrients. Even when you add them to meals that you prepare, it is advisable to do so before the end to make it less exposed to high temperature and thereby retain freshness. Since they very easily absorb water, they can be enjoyed every morning by letting them previously stand for ten minutes in a glass of water. In that time they swell and practically get a gelatinous mass that you can be eaten with a teaspoon. Nutritionists recommend that people under the age of 50 consume 38 grams per day for men and 25 grams for women, while people over the age of 50 consume on the principle of 30 grams per day for men and 21 grams for women. Although it is recommended for people who suffer from certain health problems, chia seeds are the best choice for many athletes. Due to the high levels of proteins that are contained along with minerals, they are often found on the menu of those people who engage in sports, because they build and regenerate muscles. It is interesting that these tiny seeds contain tryptophan, a protein that in addition to satiety, helps when it comes to quality sleep, and are recommended for people suffering from insomnia. Very easy to combine with every meal and fits your diet, and does not cause allergic skin reactions. Chia seeds have become popular in recent years because of its high nutritional value and many health benefits. As noted above, these seeds contain high levels of omega-3 fatty acids that are important for our body and they are the right food for the brain. Because of the fact that they are abound in this useful food, it is advisable to use it as a food additive, because there is hardly any food we can consume that has enough omega-3 fats. In addition, chia seeds reduce insulin resistance and improve blood sugar levels, and are a great choice in the fight against type 2 diabetes, which often occurs. It is interesting that, compared to traditional bread, one that is made from chia seeds it favours to reducing blood sugar and as such it is advisable for everyday use for people suffering from diabetes. It is known that today's lifestyle exposes all of us to stress that there are serious consequences for our body, but most often with the digestive system. For problems with irregular bowel movements and the so-called lazy intestines, chia seeds provide fibre distribution needed for the colon and allows the proper operation of the digestive system and regular emptying. In addition, the diet based on fibres which is abundant in these seeds helps in reducing swelling and inflammation of the colon. Chia seeds contain a number of useful plant compounds. The most common is chlorogenic acid, which is a natural and powerful antioxidant that reduces blood pressure. Next to it, there is caffeic acid, which is abundant in the seeds and which is an ideal ally in the fight against inflammatory processes in the body. Scientists have also found that chia seeds contain quercetin and kaempferol, two antioxidants that reduce the risk of heart disease, osteoporosis, and proved to be useful in the prevention of malignant diseases and other chronic diseases. In particular, it is advisable for children who have problems with demineralization of the bones, which leads to the occurrence of rickets, and in adults to osteomalacia. For fans of light sweet meals, we have prepared a special surprise. Namely, when chia seeds are combined with your favourite fruit, you can make a perfect healthy dessert for you and your household. Optionally, you can add fruit if you want, but the most beautiful taste of the pudding is with bananas, strawberries, blueberries and mango. It is necessary to mix the milk, chia seeds, coconut and honey. Stir until the mixture unites, and then put it in the fridge for a few hours, it is best to stand overnight. Before you start serving, it is recommended to let it stand at room temperature. For the fruit puree, you can use only one food, but much more beautiful effect will be achieved by combining several different fruits. Prepared, washed and cleaned fruits needs to be cut first, and then mixed in the blender. If desired, you can add a little honey in the preparation, in order to eliminate acidity. If you are unable to make a puree, you can cut the fruit into small pieces and as such use it. In the bowls pour the pudding layer, then a layer of fruit, then again a layer of pudding and on top you can put fruit sprinkled with coconut. This dessert is very healthy, because it contains natural sugars that break down slowly in the body as opposed to the purchased pudding that is rich in sugars and artificial sweeteners. Today, these drinks have become very popular, and also are easy to make and are very tasty. To combine healthy and tasty, and thus get a smoothie from chia seeds, you need to make the most of the creative fruit you have in the fridge. We will give you one idea of ​​how to build a very light drink from these useful seeds. Put these ingredients in a blender and mix until blended into the mixture. If desired, you can also add a carrot to a smoothie for even finer taste and colour. To prepare this smoothie, it takes only a few minutes, since it is very rich in essential vitamins and minerals, it is the ideal breakfast for a healthy start of the day. Chia seeds are relatively easy to find in any larger supermarkets, given that due to the increasing popularity in recent years. In addition, there are in almost all well-stocked shops with healthy foods, where it is more advisable to buy them because they are fresher and you can choose the amount you want to buy, and it is possible to order them over the Internet. Price of chia seeds is around 3 dollars for 100 grams, which of course depends on the manufacturer and seller. When buying you should pay attention to the seeds they need to be black and white, while necessarily you need to avoid those that are red because they are not yet mature. Also they can be found in the form of snacks, savoury bars and a variety of beverages. No matter how you use chia seeds in the limits of the recommended daily doses, you will give your body a rich source of nutrients and minerals that will improve your general health. Who should not eat chia seeds? Although the nourishing properties of chia seeds are proven and scientifically confirmed, doctors learned certain information after more detailed analysis. The people who have the prostate cancer or have high inherent risk of getting this malignant disease should avoid the use of large quantities of chia seeds. The reason for this lies in the fact that the omega-3 fatty acids are in the form of alpha-linoleic acid, whose high intake in the body can lead to prostate problems. 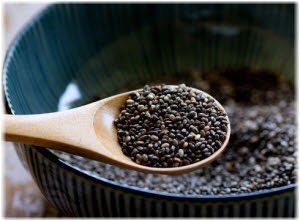 In addition, people who have high triglycerides should consume chia seeds of special sort - these are Salba seeds. Doctors have found that the use of all other species may lead to increased levels of triglycerides in the body.